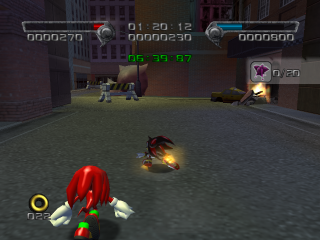 Central City one of five possible fourth levels of Shadow the Hedgehog; in the game's branching path structure, it follows taking a highly evil, Robotnik / Black Arms-aligned path through the previous levels. As capital city of the United Federation, Central City is a priority target for the Black Comet's invading aliens, and Black Doom places Shadow at the head of the Black Arms reinforcements to entirely annihilate the metropolis. Central City is a blasted warzone when Shadow arrives, faring even worse than Westopolis did. Crimson fruits dot the landscape and entire districts have been flooded with toxic fluid. GUN helicopters fly between the husks of ruined skyscrapers, while military roadblocks litter the streets. Black Arms city-buster bombs are counting down their last eight minutes to finish the city off; the black hedgehog can either facilitate their detonation, or aid Knuckles the Echidna in sweeping the bombs with vacuum guns. The first of the 'Pure Dark' levels, Central City is only accessable by taking the evil route in Cryptic Castle - which, curiously, involves fighting against the Black Arms by helping Eggman defend his fortress. Nonetheless, Shadow's general behaviour up to now seems to have satisfied Black Doom as to his loyalties. Before the level begins, the alien leader tells Shadow that his past is "filled with hatred and contempt for the humans", and that he should take revenge on them with his own two hands. To this end, the hedgehog is told to detonate five giant bombs which the Arms have set around the city. Standing in the Arms' way is also Knuckles the Echidna, helping out the human defenders as he did in Glyphic Canyon. Knuckles asks Shadow to help in defusing twenty smaller bombs, which can be accomplished by grabbing a vaccum gun (or Vaccum Egg from a special crate) and sucking the devices up harmlessly. Moving foreward from checkpoint three will bring you through a tunnel and into an ooze filled street that you need a car to get through. The door's right across the street to the left a bit. It contains an Air Saucer which is more maneuverable than the car.